Robinhood pokies is developed by NetEnt and has a big choice of special symbols and many other unique options. The theme of the game is well connected with the widely known national hero Robin Hood. This excellent video game is rich for animation effects and high-quality graphic design. The gameplay starts with a very interesting and exciting short movie. After that you will see the gaming screen which is parceled into 5 rotating columns. You can play the pokies with all 20 lines which are always activated and also has a unique Shifting Reels Feature and prize spins. You will find the brave characters from the popular legend, Norman knights and the signs of the playing cards as game symbols. Two of three similar icons positioned side by side on the active line and starting from the 1st column create a successful sequence. When the winning combo is formed, the reels shift one position to the right awarding a player with a multiplier which varies x2-x5. That’s how the Shifting Reels feature acts. The Bonus symbol depicted with a money bag triggers the free spins bonus game. When 4 bags are collected in one chest, a player will receive 10 free rotations. During this round you need to choose the icon which will act as the Extra Wild. This symbol can appear only on the last 3 reels. 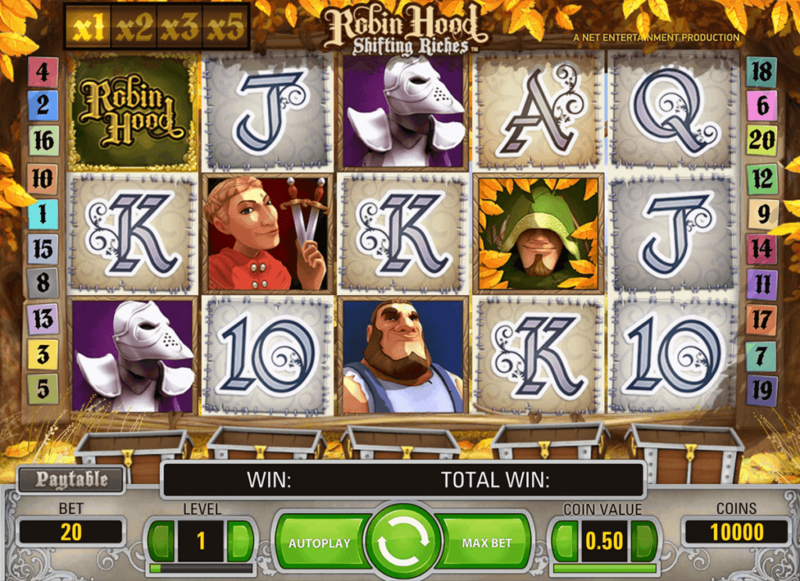 Robin Hood: Shifting Riches is one of the best free pokies with bonus features. The icon with Free Spins word is a bonus feature which acts only in the bonus round and it adds the additional prize spins. Two such elements award you with 5 spins and 3 icons trigger 10 free rotations. Play for free or with real money at online casinos powered by NetEnt.